Designed by: architect David Moreira da Silva and civil engineer J. Bastian . Architects David Moreira da Silva e Maria José Marques da Silva Martins [1949-1950]. 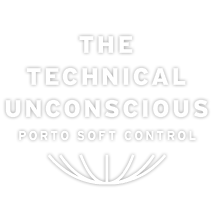 Location by: city of Porto, ruas da Alegria and Rua de Anselmo Braamcamp, head office building, workshops and social facilities. A group of buildings designed and built during the 1930s/1940s (head office building, workshops) and 1960s/1970s (residential tower/hostel, school), for a particular area of the city and in which each of its constituent elements possesses a distinct aesthetic language, designed to perform different functions. The head office building, the workshops, the different spaces provided for the stonemasons and, finally, the residential tower/hostel and José Moreira da Silva school are parts which were assembled/incorporated in the same area of the city and still today impose themselves on the contemporary urban landscape. A group of buildings assembled on the city´s skyline, on a high elevation site between the Rua da Alegria and the Rua de Anselmo Braamcamp, it became a permanent sign of reference for the then Sociedade Cooperativa de Produção de Operários Pedreiros Portuenses [Cooperative Society of Stonemasons of Porto], a presence […] resulting from the actions and discourses of the city (CORTES, 2008). The Stonemasons´ Cooperative invested in this rough terrain the income which they had themselves earned. On 23 May 1927, the Cooperative Society of Stonemasons of Porto purchased the land from António Maria de Miranda Vasconcelos and his wife ´[…] with a ruined farmhouse, located between buildings in the Rua Anselmo Braancamp, Rua Alegria and Rua Herois de Chaves [….] having in this latter street a frontage of three and a half square metres, with an entrance also in the Rua da Alegria nº 598, a shared easement with this building […] (CRPP, LB, 145). The first interventions in this area were made at the beginning of the 1930s, in an urban space bounded by the Rua da Alegria and the Rua de Anselmo Braamcamp, with the alteration of a facade and the adaptation of an existing building and property of that institution, the canteen and the coal store. Dating from May 1937 the first design signed by David Moreira da Silva and the civil engineer J. Bastian was developed during the period of David Moreira da Silva´s residence in Paris as a student at the École Nationale Supérieure des Beaux Arts de Paris and at the Institute of Urban Planning in the French capital [1934-1939]. From 1949 and 1950 can be dated the additions made to this design by the architects David Moreira da Silva and Maria José Marques da Silva Martins. These provided for the construction of various adaptations to the topography of the location, bearing in mind hygienic, functional and social aspects. These took place at different levels, involving dormitories, infirmary, medical office, treatment room, classroom, library, administrative office, bathroom and toilet, canteen, storage room, boiler room, meeting rooms, dressing room, rest room, workshops facing the Rua de Anselmo Braamcamp, and administrative space accessed from the Rua da Alegria. David Moreira da Silva, son of the cooperativist José Moreira da Silva, actively participated in the development of the design, alone at first, and later in partnership with his wife, throughout the process which would culminate in its materialisation. The architect couple took on the commitment and collaboration with SCPOPP unconditionally to the end of their careers. José Moreira da Silva was inextricably linked with the completion of this cherished project. He was a master mason and one of the ten creators/founders in March 1914 of SCPOPP, an institution designed to promote cooperation between stonemasons, and to help protect the interests of this group during a period of much social tension resulting from an environment characterised by precarious living and working conditions. He was an enterprising man, responsible for the introduction of the polished granite industry to Portugal in 1937, a decision taken during his visit to the Universal Exhibition in Paris, when he made a contract with the Société Marbrière de Paris at a time when his son was studying in that city. Dating from his visit to this international event was his intention to create and install the first workshops on the land previously acquired by the institution and in which he would actively participate as managing director until 8 December 1969, the year of his death. He possessed a spirit of initiative and enterprise linked to social solidarity, as well as other qualities such as the championship of cooperativist ideals, a peaceful spirit, respectful, responsible, friendly, conciliatory, sensible, determined. […] A spirit of initiative, a capacity for foresight and achievement, and the ideals of defending the professional and social rights of stonemasons (FIMS/MSMS/4387 e 4388). Anyone who observes the city from its eastern side (Fig. 1) will see on its horizon an enormous block of masonry punctured by windows, a construction that develops horizontally, associated with another building which imposes itself vertically. 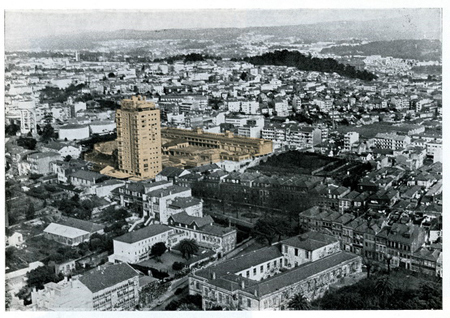 The first building of this group corresponds to the initial workshops and storage spaces of SCPOPP, the second, the Miradouro Tower - both insert themselves, mark and dominate the urban landscape in an imposing manner, possess a temporal dimension, and are a strong, referential image associated in a unique way with an institution, a sight familiar to the eyes. Municipal Historical Archive of Porto - Books of the Licensing of Works. Foundation Institute Architect José Marques da Silva: FIMS/MSMS/4387 and 4388; FIMS/MSMS/1529 FIMS/MSMS/3975 – correspondence between David Moreira da Silva and the Mayor of Maia, Dr. José Vieira de Carvalho [1977-1984]. 1st Land Registry of Porto - Books of Building Specifications and Registration Transfers. CORTÉS, José Miguel – Políticas do Espaço. Arquitetura, Gênero e Controle Social. São Paulo: Editora Senac São Paulo, 2008. ROCHA, Hugo – As Obras de Santa Engrácia do Pôrto Acabarão de Se Fazer?. Tripeiro, Série 5, Ano 1, nº 1 (1945) pp. 19-20. SOCIEDADE Cooperativa De Produção Dos Operários Pedreiros Portuenses – relatório de Contas da Comissão Executiva e Parecer do Conselho Fiscal – exercício de 1969. Porto: Imprensa Social, 1970. SOCIEDADE Cooperativa De Produção Dos Operários Pedreiros Portuenses - relatório de Contas da Comissão Executiva e Parecer do Conselho Fiscal – exercício de 1976. Porto: Imprensa Social, 1977. SOUSA, Francisco de Almeida – A Cooperativa de produção dos Operários Pedreiros Portuenses. Tripeiro. Porto, Série Nova, Ano 9, nº 8 (1990), pp. 234-238).